The Christmas rush is in full swing. Fight the stress by treating yourself to Martin Purefoods’ ready to cook Philippine Style Pork Adobo. Available at select grocery stores. Subscribe to the Martin Purefoods YouTube channel where you can watch our latest videos. Martin Purefoods goes international again with the new, ready to cook Korean Style Beef Bulgogi. http://bit.ly/2fW1qus. Now, available at select grocery stores. After over 25 years of quality Filipino meat products in the US, Martin Purefoods goes international with Korean Style Spicy Pork. Now available at select grocery stores. Martin Purefoods Philippine Style Chicken Adobo is now available at select grocery stores. Kain na! 5 NEW Products – Now Available! 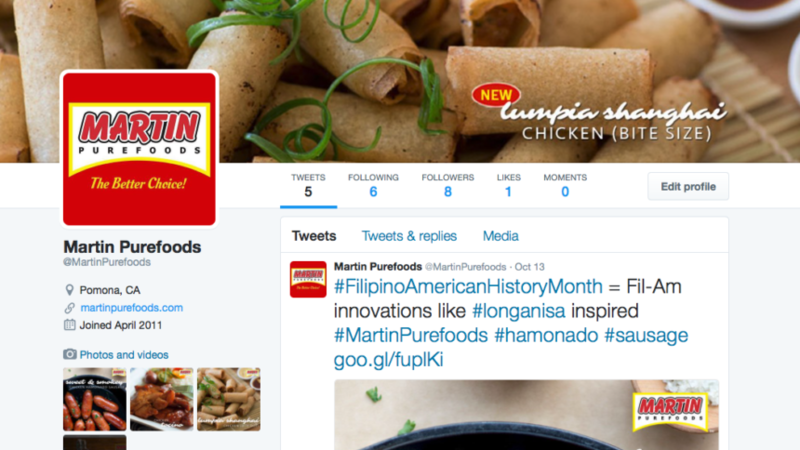 Get up-to-date with everything Martin Purefoods. Follow us on FaceBook, Instagram and Twitter.